Gobble Tov! Are You Ready for Thanksgivukkah? Carve the turkey and pass the sweet potato latkes: Thanksgivukkah is almost here! This holiday miracle won’t occur again until the year 79,043. What miracle, you ask? Thanksgivukkah celebrates the rare convergence of the first day of Hanukkah and Thanksgiving. Both land on the same day this year. The last time they overlapped was in 1888, just 25 years after Abraham Lincoln declared Thanksgiving a national holiday. Some Jewish Americans are taking advantage of the coincidence to give thanks for religious freedom, like a Massachusetts rabbi who composed the Ballad of Thanksgivukkah. For others, the holiday merger is pure fun (and a little marketing). A 9-year-old in New York invented a “Menurkey,” a turkey-shaped menorah, and raised $48,000 on Kickstarter for the invention. Woodstock-inspired t-shirts feature a turkey on the neck of a guitar and the phrase, “8 Days of Light, Liberty & Latkes.” Even comedian Stephen Colbert got into the spirit when he tried in vain to trace a turkey-menorah around his hands. Inspired to mix a little Hanukkah into your Thanksgiving? Our cake pop guru Marsha Johnston’s Menurkey cake pops and pumpkin-cheesecake dreidels are sure to make every pilgrim and rabbi at your table rejoice. Bake your favorite spice cake mix, adding a teaspoon of cinnamon and a teaspoon of pumpkin pie spice. Bake in a 9×13 inch pan. When cool, crumble into a bowl. Add enough pre-made American buttercream to mix into a smooth, dough-like consistency. Roll into balls and refrigerate for a few hours, covered. Stick cake pops with lollipop sticks and then dip into your favorite candy melts or dark chocolate. We prefer Merkens brand which is available at cake and candy supply shops. Add birthday candles for feathers before frosting hardens. Use store-bought candy eyes and decorations, or icing to finish off your turkeys with curls and yamakas. Mix dry ingredients together in a mixer. Cut butter into small pieces. Add all at once to mixer and keep at low speed until mixture resembles corn meal. Dribble in 1/4-1/3 cup cold water and mix on medium until it just comes together. Let rest for a while in the refrigerator and then roll out on lightly floured board. Cut into dreidel or star shapes. Mix cream cheese with brown sugar and spices until light and fluffy. Add eggs; one at a time and then the puree. Fold in pecans. Spoon about one tablespoon into the center of your pie dough cut outs. Brush edges with a beaten egg and place another cut out on top. Seal well. Brush with more beaten egg and sprinkle with sugar and cinnamon. Bake at 375 until brown, about 15-20 minutes. Let cool and gobble tov, you’re done! Oy Veh! I Have to Bake? So you’d love to wow your friends and family with Thanksgivukkah delights but don’t think you’ll have the time to bake something special? No need to kvetch, we’ve got the perfect shortcut. A frosting curl here, birthday candles instead of candy corns there, and presto! 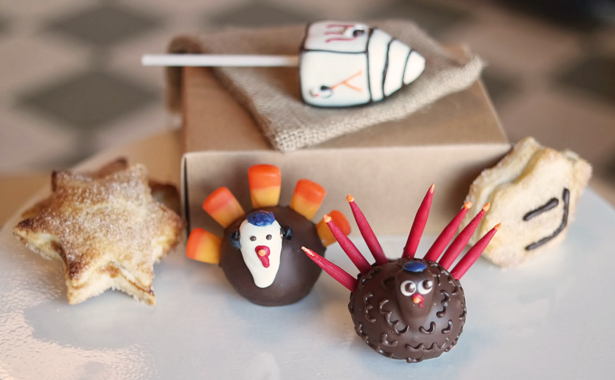 Our turkey cake pops are transformed into menurkey pops. We’ll deliver them to your door or your host’s just in time for Thanksgivukkah.